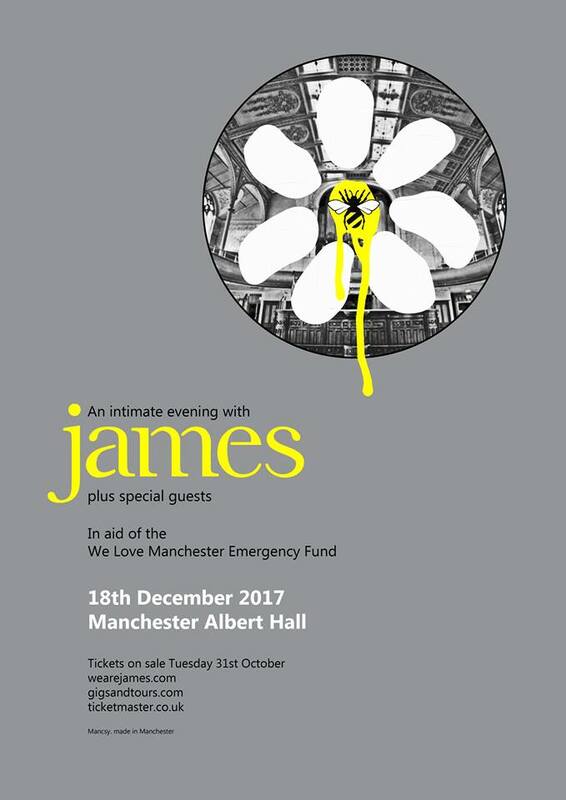 James have announced a one-off fundraiser for the Manchester Arena bomb appeal on Monday 18th December. Tickets for the sure to be sought after show go on sale on Tuesday morning at 10am..
Back in the summer James had attempted to arrange a short notice fundraising show but were denied by logistical complexities, but have made good on the promise from front man Tim Booth that they would come back and perform a show. At their Castlefield show in July they donated profits from a special t-shirt that featured both the Manchester bee and the James daisy to the fund. The 2,000 capacity Albert Hall gig is sure to be an intense show as they're used to playing in venues up to ten times the size in what is still seen as their home town. The announcement comes as James are back in the studio to record their thirteenth studio album including some songs that were previewed at their festival shows over the summer. Provisional titles include Busted, Overdose, Trouble, Mask and Backwards Glances and the album is planned for release at some point in 2018. The poster for the show has been designed by mysterious enigmatic Manchester artist Mancsy. Tickets are on sale at 10am tomorrow from Gigsandtours and Ticketmaster priced at £45 plus fees.